5/5 I am satisfied with the school and teachers. A lot of parental involvement is the best part. Lots of activities and functions. Teachers give individual attention to the child. Shri Ram Global School (Srgs, Sector 45) is a school in Gurgaon offering CBSE for Nursery, Kindergarden and Primary School level students. The school was founded in 2012 as a Private Co-Educational school. The school is located Sector 45. Tannu and 23 other people have rated this school. This school was last reviewed on 1 Jul 2017 and first reviewed on 2 Jan 2016 at SchoolWiser. The overall experience with Shri Ram Global School (SRGS, Sector 45) based on the ratings left by users so far seems to be good. This score is among the top 80% among other schools in gurgaon with miniumum twenty ratings available at SchoolWiser. This school seems to perform exceptionally well at Teacher's Competence parameter. It also performs well on Parental Involvement, Academic Rigour & Principal's Leadership. Though parents may seem to have some reservation over Transport. Checkout detailed ratings and reviews below for reference but do exercise your best judgement. The Shri Ram Global School (SRGS) has been set up as an initiative by the Shri Ram Education Trust (SRET) led by Vivek Bharat Ram of the Shri Ram family. The Shri Ram family has been in the forefront of education for almost a century. Through the Shri Ram Education Trust they have set up numerous educational institutions to deliver quality education and establish a brand in the field of learning. SRGS brand of day schools is their step in the same direction. Shri Ram Global School in Gurgaon is currently operating out of two different campuses for its pre-primary and primary wing. The child needs to be minimum 3 Years as on 31 March 2019 to be eligible for Nursery admission. School Admission applications can be made Offline at the school. Originals and copies of the following documents are typically required for processing application of admission: Proof of residence, Photocopy of the Birth Certificate, Two passport size photographs, The Original documents must be furnished at the time of meeting and Transfer Certificate. New academic session for the school starts from April. You can find further details below for reference on admission eligibility and application for Nursery and Higher Grades in the section below, but we strongly recommend that you check the school website for most accurate and up-to-date information. 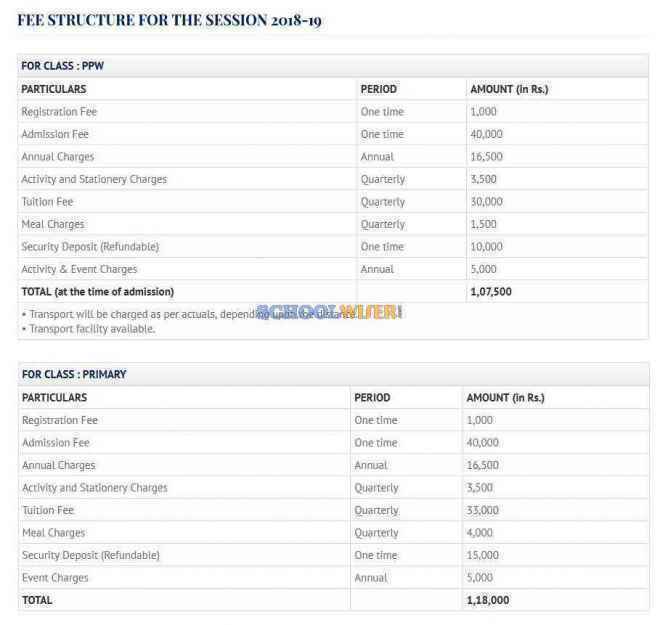 A detailed fee structure & complete breakup for Shri Ram Global School (SRGS, Sector 45) is provided below for reference. 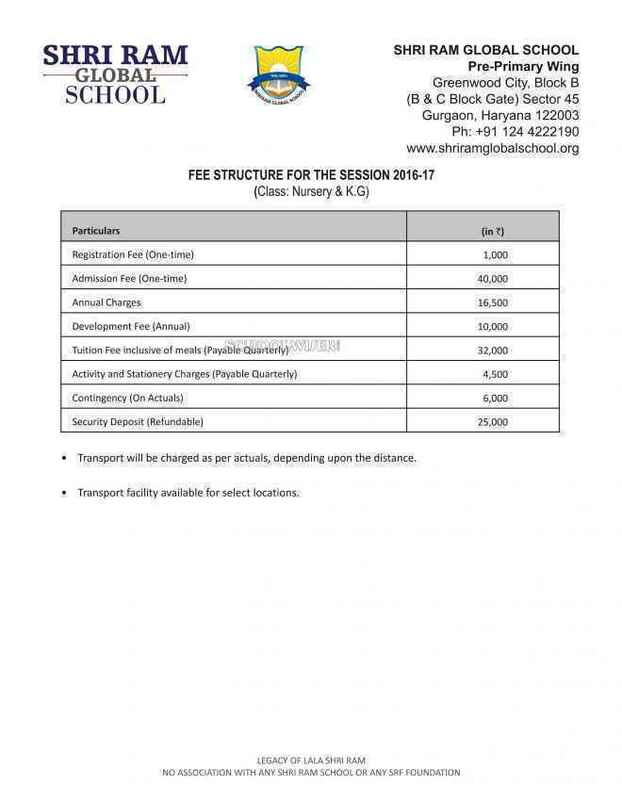 The objective of the fees details below is to provide an economic reference point for parents to understand approximate expense for this school and evaluate affordability based on their current circumstances and for the long term. For parents admitting their children in admission session 2018-2019 at The school the total school fees for the first year including all admission related charges for Nursery but excluding transport fees shall be around Rs.2,12,500. This includes total One-Time Admission related Charges including Refundable Security of Rs.51,000. For parents continuing in the school from previous years, the effective annual fees is around Rs.1,61,500 i.e. approx. Rs.13,458 per month or Rs.40,375 per quarter without transport fees. The school observed an overall fee decrease of approximately 17% from the 2017-2018 session. SchoolWiser is usually one of the first places to look for breaking news on schools. Shri Ram Global School (SRGS, Sector 45) was most recently in the news for CCI rejects anti-competitive charges against Shri Ram Schools. Get all the latest news and updates at SchoolWiser. Below we have aggregated relevant recent, ongoing & past news articles from leading publications such as Business Standard. 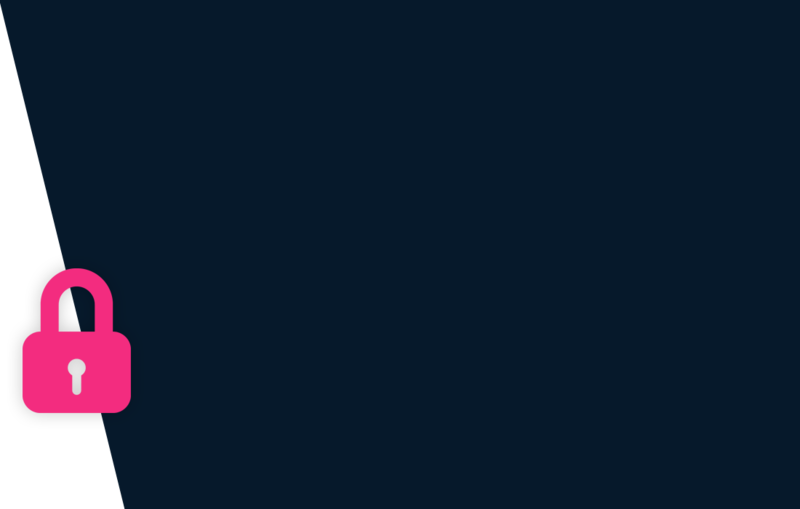 The schools news links shall take you to originally published articles on external news sites.